Sultan-ul-Ashiqeen Hazrat Sakhi Sultan Mohammad Najib-ur-Rehman is the 31st Shaikh of the Sarwari Qadri order. Sarwari Qadri order originates from the Prophet, consequently reaches the Mohammadan umma (nation) through Ali ibn Abi Talib. This chain spiritually passed to many great Saints in a continuous manner, consequently reached Shaikh Abdul Qadir Jilani. From where it reached Sultan Bahoo. Presently Sultan Mohammad Najib-ur-Rehman is its spiritual guide. Sultan-ul-Faqr VI Sultan Mohammad Asghar Ali blessed him with succession. Arains trace back to Shaikh Saleem Al-Raee, whose genealogy meets Prophet Mohammad’s genealogy, six steps backward at “Loee”. Shaikh Habib Al-Raee’s son Shaikh Haleem Al-Raee came to India from Arab with Mohammad Bin Qasim for preaching. Afterwards, Shaikh Haleem Al-Raee and his family settled in India. Their progeny got name of Raeen. In fact, it changed to Arain with the passage of time. Before the partition of the subcontinent, Sultan Mohammad Najib-ur-Rehman’s ancestors lived in Mudhan village, Jalandhar India. After the creation of Pakistan, they migrated to Pakistan sacrificing many lives and all their property. In Pakistan, they initially settled in Shahkot, Lyallpur (present Faisalabad). Then Sultan Mohammad Najib-ur-Rehman’s father Abdul Hameed shifted to Bakhshan Khan, Tehsil Chishtian, District Bahawalnagar, Pakistan. Sultan-ul-Ashiqeen Sultan Mohammad Najib-ur-Rehman’s father was Abdul Hameed rehmat-ul-Allah Alayh. He was born on February 8, 1931 (21 Ramadan, 1349 H) Sunday at Madhan Tehsil Nakodar, District Jalandhar, India. He got education upto middle standard and started working with his father in agriculture. Alongside, he also learnt accounts from a Hindu that paid him a lot in his practical life. He was punctual about offering his midnight (Tahajjud) prayer. Therefore he used to stay awake worshipping Allah at night since his early age. Sultan-ul-Ashiqeen says that he had never seen his father ever missing any voluntary prayers, let alone missing the compulsory ones. He used to offer supererogatory prayers (nafl) getting up at the half-passed night, then recited the Holy Quran from midnight until dawn. After offering Fajr (dawn salat) prayer, he used to do invocation (zikr or dhikr) of Allah’s name until sunrise. Sultan Mohammad Najib-ur-Rehman’s mother name was Kaneez Fatima. She was daughter of Chaudhry Sharf Din. She born in Jalandhar city on Saturday, 4, August 1934 (23 Rabi-al-awwal, 1353 H). Her father Sharf Din was a secondary school teacher. She had received education till middle standard at the time of creation of Pakistan. Her father died a few months before Pakistan came into being. After migration, her family settled in Montgomery (Sahiwal). Moreover, her wedding took place with Abdul Hameed on Thursday 13, March 1958 (21 Shaban, 1377 H). Meaning: Salutations upon you O beloved Prophet. Sultan-ul-Ashiqeen has a great influence of his mother’s nature on his life and personality. Apparently, he also resembles a lot to his mother. She died on Wednesday June 6, 1990 (12 Ziqa’ad or Dhul al-Qadah 1410 H) at 3:00 a.m. in Lahore, Pakistan. 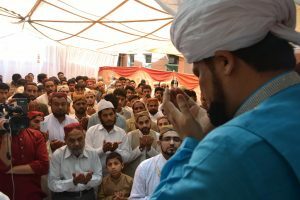 Sultan-ul-Ashiqeen’s father died in 2004 on Friday, June 18 (29 Rabi ath-thani 1425 H) at 10:00 p.m. His parents are buried in the graveyard of Kareem Block, Allama Iqbal Town, Lahore, Pakistan. Entering the graveyard from northern side, in front of the college, on the right side are the graves. Moreover, there are also the graves of his beloved daughter and father in law. The sacred birth of Sultan-ul-Ashiqeen took place on Wednesday, 19th August 1959 in Bakhshan Khan, Tehsil Chishtian, Bahawalnagar District, Pakistan. Islamic date is 14th Safar, 1379 H. Time was at 4:30 a.m. Since eternity, Allah has chosen Sultan-ul-Ashiqeen for the Treasure of Faqr. So the Divine Light illuminates upon his countenance since birth. Once, a Fakir viewed his celestial forehead and told his mother; “Allah has chosen your son for a sacred purpose. Allah has written a special destiny on his forehead. Therefore, he will spend his whole life under the supervision of Shaikh Abdul Qadir Jilani. Moreover he will prepare him spiritually to execute a very special responsibility”. On another occasion, a Dervish said, “Your son is a leader. Wherever he will go, he will lead”. Hence, to prepare him to execute the hardest duty, he passed through severe hardships since the early life. Sultan-ul-Ashiqeen Sultan Mohammad Najib-ur-Rehman started his regular education from Dipalpur District Okara, Pakistan. In spite of financial crisis, he completed the Quranic and other religious education due to his God gifted qualities. Since childhood, he found peace and spiritual tranquillity in getting the knowledge of religion because of his love for Allah. Moreover, not only the Quran but other books also about Islam and Islamic history attracted his attention the utmost. In addition, he completed his matriculation from Government High School Dipalpur, District Okara. It is noteworthy that his writing skills also started manifesting from childhood. Hence, he began to write essays in the children sections of newspapers during his fifth standard. Therefore, his essays have been publishing in the children’s editions of renowned newspapers. Such as, Roznama (Daily) Wafaq Lahore, Roznama Masawat Lahore, Roznama Mashriq Lahore and Roznama Imroze Lahore. His family had been facing financial problems since his childhood, so he could not continue his education regularly. Even in such crucial conditions, he did his intermediate in 1980. Moreover, he did graduation in 1983 in first division as a private student alongside doing part time jobs. In 1983, Okara officially became a district. Therefore, many district offices were present there. He worked in a district office but he knew that it was not possible to progress in this city. So, he had been often visiting Lahore for interviews and exams for different designations. At last, he got a government job in 1985 in Lahore. Consequently, he migrated to Lahore on April 12, 1985. In short, this migration proved to be a blessing, which opened all avenues of financial comfort. He continued this job with devotion and hard work for twenty-eight years. Afterwards he got retirement in December 2013. After shifting to Lahore, he married and had started a happy and well-settled life. Soon, he overcame the attraction of wealth and an intense desire arose to get closeness of Allah. Despite all the luxuries, his inward was not contented. Moreover, he was unable to find peace in any worldly pleasure. Therefore, to find satisfaction of soul he started to meditate and pray excessively. He was only thirty-seven when he devoted himself completely to Allah. Gradually, his soul became more and more anxious to meet his beloved. This created an upheaval in his inward. Once, in the days of his service, he got out of the office to offer noon salat (Dhuhr or Zuhr). A middle-aged man dressed strangely encountered him suddenly and said, “The period of Allah’s beneficence upon you has started. Sustain your condition in the same way”. Sultan-ul-Ashiqeen asked the man, “Who are you?” He replied, “I am the one who shows the right path to people and guides them. Therefore I have come only to see you”. At first, Sultan-ul- Ashiqeen thanked and had stepped ahead. Only after a few steps, a thought flashed that how the man knew his inner state. At once! Sultan-ul-Ashiqeen returned and searched that man but he had disappeared. On inquiring about him from the people around, he came to know that no one had seen such a man around. It was the night of 12th April 1997. Sultan-ul-Ashiqeen had offered supererogatory prayer after midnight. He was offering salutation to Prophet Mohammad (pbuh). All of sudden his esoteric self was enlightened. Consequently, he found himself in the Mohammadan Assembly (Majlis-e-Mohammadi). The eternal Divine light, the Holy Prophet (peace be upon him) was sitting in the middle. Furthermore, Ali ibn Abi Talib, Imam Hassan and Imam Hussain (may Allah be pleased with them) were sitting on his right side. While on his left were Abu Bakr Siddiq, Umar ibn Khattab, and Usman ibn Affan. After them on the left side, there were the leaders of the four spiritual orders. Sultan-ul-Ashiqeen remained stunned with awe and majesty of the Mohammadan Assembly. He was about to collapse with surprise and fear. Meanwhile Ali ibn Abi Talib, stepped ahead and held his hand in his own hand. After this, he presented him before the Holy Prophet letting him sit by the sacred feet of the Prophet. Respected Ali said to the Prophet, “My lord, he is Najib-ur-Rehman. He is your slave and is the spiritual son of your dear daughter (Fatimah tuz-Zahra). She has selected him to grant her legacy (of Faqr). For your approval, she has presented him to your court”. Prophet Mohammad then stretched his hands towards him for oath of allegiance. So, Sultan-ul-Ashiqeen held the sacred hands of the Prophet and took oath of allegiance. After that, the Holy Prophet looked at the spiritual guides of the four orders. Then he said to Shaikh Abdul Qadir Jilani, “You have his spiritual legacy.” After that, he handed him over to Shaikh Abdul Qadir Jilani. He said, “He is our darling daughter’s spiritual son and now he is our spiritual son. You are entrusted to give him spiritual knowledge”. Sultan-ul-Ashiqeen describes that he kissed the feet of the People of Cloak and Rashidun Caliphs on having such a blessing. Everyone congratulated him and caressed his head. Afterwards, Shaikh Abdul Qadir Jilani having permission of the Holy Prophet came back along with Sultan Mohammad Najib-ur-Rehman from the Mohammadan Assembly. Therefore, started his spiritual training. In January 1998, Shaikh Abdul Qadir Jilani ordered Sultan-ul-Ashiqeen to search for a living spiritual guide. Therefore, he visited different places within and outside Lahore. Furthermore, he met many guides but any one of them did not satisfy him. In February 1998, he had a dream. In which an attractive man with an enlightened face said, “Come my son, I am waiting for you”. On waking up, he was surprised and started his quest for that awe-inspiring face. However, many days passed and his search could not meet the destination. Moreover, there was no sign or indication even from Shaikh Abdul Qadir Jilani and Data Ganj Bakhsh. Again, in March 1998, he dreamt about that spectacular face of Sultan-ul-Faqr VI. He said, “Son! You have struggled a lot and suffered through many hardships. Now come to me”. He added while pointing to the Ism-e-Allah Zaat, “I have this trust of yours. I have been waiting for you for long to entrust it to you”. However, the situation remained the same as to where could that face be found? Again, he started his struggle. On 12th April 1998, early morning he reached the shrine of Sultan Bahoo. Sultan Bahoo said, “You are my beloved as well. Just go to Sultan Mohammad Abdul Aziz’s shrine, there you will find your spiritual guide Sultan Mohammad Asghar Ali. He is the one you were looking for”. Then he said, “Go! Your spiritual guide is waiting for you. Have your legacy from him”. Immediately, he reached the shrine of Sultan Mohammad Abdul Aziz. As soon as he entered the room, he saw the same charming face of his dream. Finally, he felt as if he had found the treasure of both the worlds. Sultan-ul-Faqr VI Sultan Mohammad Asghar Ali looked at him and said, “So you have come”. Only he could hear his spiritual guide’s words in the room full of people. Sultan-ul-Faqr took his oath after sunset salat (Maghrib prayer or Nimaz-e-Maghrib). The date was 12th April, 1998 (15th Zilhaj or Dhul al-Hijjah, 1418 H) Monday night. The very first day he became the beloved of his spiritual guide. From that day onwards till today he is stationed at the highest levels of belovedness which are elevating every moment day by day. He got so much absorbed in the Divine love of his spiritual guide so that he forgot his own existence. All his friendships, relations and other worldly matters lost their importance. Moreover, his main concern and first priority was the comfort and happiness of his spiritual guide (Pir-e-kamil). Therefore, he was ready to sacrifice his entire wealth for merely one smile or a glance of love from his beloved spiritual guide. He took upon the duty of making clothes for his Murshid for all seasons. Moreover, dresses of all the events such as Eid and urs (death anniversaries) of spiritual guides. In addition, he did this duty throughout the life with such devotion that he forgot to get his own dresses. When he made his house in Mustafa Town Lahore, he got a room specially made for his spiritual guide. Sultan Mohammad Asghar Ali assigned him the duty of publishing the Magazine “Mahnama Mirat-ul-Arifeen Lahore” as its chief editor. 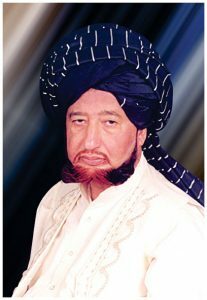 In November 2001, Sultan Mohammad Asghar Ali assigned Sultan Mohammad Najib-ur-Rehman the duty to establish “Maktaba-ul-Arifeen”. Apart from this, Sultan Mohammad Najib-ur-Rehman also devoted his house in Education Town. His spiritual guide assigned him auspicious duty of preparing the gold Ism-e-Allah Zaat as well as the printed ones. In all honesty, he performed this duty throughout the remaining life of Sultan Mohammad Asghar Ali. A few moments before his demise, he called up Sultan-ul-Ashiqeen on phone to inquire about this particular duty. He also gave the responsibility of Bait-ul-Maal (Treasury) of Islahi Jamat to Sultan Mohammad Najib-ur-Rehman. As in the matters of money, he could trust only him. In November 2001, Sultan Mohammad Asghar Ali made him the supervisor of Islahi Jamat, Lahore. He made so many efforts for its progress. In 2001, Sultan Mohammad Asghar Ali intended to perform Hajj. He told Sultan-ul-Ashiqeen, “This Hajj is important for you and me as well”. Sultan-ul-Ashiqeen had already spent all his wealth in the way of Allah. Therefore, he had to sell his car to meet the expenses for himself, his Murshid and the other companions. Hence, from 28th February till 28th March 2001, Sultan Mohammad Asghar Ali performed Hajj. Moreover, Sultan Mohammad Najib-ur-Rehman and few other selected disciples accompanied him. He presented Sultan Mohammad Najib-ur-Rehman in Mohammadan Assembly there. Consequently, Holy Prophet accepted and approved him as heir of Sultan Mohammad Asghar Ali. However, Sultan Mohammad Najib-ur-Rehman never demanded anything in return of his services and sacrifices. He performed every task and fulfilled all the responsibilities given by the spiritual guide just to please him. Due to his Divine love, sincerity and diligence, Sultan Mohammad Asghar Ali chose him as his spiritual heir. By 26th December 2003, Sultan Mohammad Asghar Ali had checked and approved Sultan Mohammad Najib-ur-Rehman. So, Sultan-ul-Faqr VI transferred the Trust of Faqr inwardly and secretly to Sultan Mohammad Najib-ur-Rehman and left this material world. Mohammad Najib-ur-Rehman is the 31st Shaikh of the Sarwari Qadri Order. He started granting Ism-e-Allah Zaat and accepting allegiance from the 14th of August 2005. Since then, he has taken revolutionary steps to shower the bounty of the Faqr upon the entire umma. The first and foremost favour upon the seeker of Allah is the invocation. In the past, disciple use to invoke Ism-e-Allah Zaat in four stages. For example i.e. Allahoo, Lillah, Lahoo and Hoo (اَللّٰہُ للہ لَہُ ھُو ). Previously, sultan of invocations i.e. Hoo was given to disciple when he had passed all the basic stages. Therefore, it was a long process and required a lot of time. Usually, most of the disciples could not reach this highest level. On the other hand, Allah has blessed Sultan Mohammad Najib-ur-Rehman with great spiritual powers. Therefore, he gives his disciples the sultan of invocations i.e. Hoo at the very first day of allegiance. Moreover, he also grants them printed or pure gold Ism-e-Allah Zaat for contemplation. Shaikh al-Akbar Mohiyuddin ibn Arabi says in Al-Futuhat al-Makkiyya that, “Hoo ( ھُو ) is the final invocation of knowers”. When the seeker gets perfection in invocation and contemplation of Ism-e-Allah Zaat, then the contemplation of Ism-e-Mohammad is given. This is for the first time in the history of Faqr by the beneficence of Sultan Mohammad Najib-ur-Rehman. In every era, there is present a perfect spiritual guide who possesses Divine Trust. In addition, he is also the heir of the treasure of Faqr. Such a perfect spiritual guide has authority to grants sultan of invocations i.e. Hoo. Moreover, he gives contemplation of Ism-e-Allah Zaat to the seeker on the very first day of his oath. It is important to mention that Sultan Mohammad Najib-ur-Rehman has all the qualities of a perfect spiritual guide. Even sincere seekers gives testimony of such qualities of him. He has the ability to purify the inward and sanctify the soul of the seekers. Ultimately, they become free of jealousy, envy, greed, lust, etc. Moreover, he blesses them with piety, patience, steadfastness, humility, gratitude and unconditional Love for Allah. Sultan Mohammad Najib-ur-Rehman has laid the foundation of Tehreek Dawat-e-Faqr. Its aim is to spread Faqr in a more organized and proper channel. Furthermore, it is a registered organization since October 2009. Regardless of any sect, group or school of thought, Tehreek Dawat-e-Faqr welcomes all the Muslims. In fact, it is an invitation for those who seek to sanctify their soul and vision of Allah. Therefore, Sultan Mohammad Najib-ur-Rehman purifies the inwards of his disciples without involving them in hard mystic exercises or lengthy prayers. Finally, he has made the bounty of Faqr common and approachable for everyone. That is why he grants Ism-e-Allah Zaat for invocation and contemplation to Muslims all over the world. He grants Ism-e-Allah Zaat with and without oath of allegiance. For those who want to swear oath of allegiance, personal meeting is preferred. However, it is not compulsory which is quite impressive and miraculous. In this way, he is the first one to make oath possible for overseas. Initially, oath required personal meeting. Since 2014, he has made it possible for the foreigner seekers to take the oath of allegiance. It is through the internet via a written oath form and audio calls. Later on, he sends Ism-e-Allah Zaat by post. Indeed, this is a milestone in the history of mysticism. Allah has truly blessed him with impeccable spiritual powers to make it possible. However, it is by the virtue of his grand spiritual status that he has opened facility for females belonging to cities other than Lahore to swear oath of allegiance online. Similarly, he has eased those male seekers of Allah who belong to far flung areas like Balochistan, Karachi, Gilgit Baltistan to swear oath of allegiance online. This is a revolutionary step taken by him. It is the first time in history of sufism that oath of allegiance can be sworn without meeting. Khanqah refers to that place where the seekers of Allah practice the invocation (zikr) of Ism-e-Allah Zaat day and night. This is where they get the company and guidance of the perfect spiritual guide to purify their souls to get enriched with the closeness of Allah. 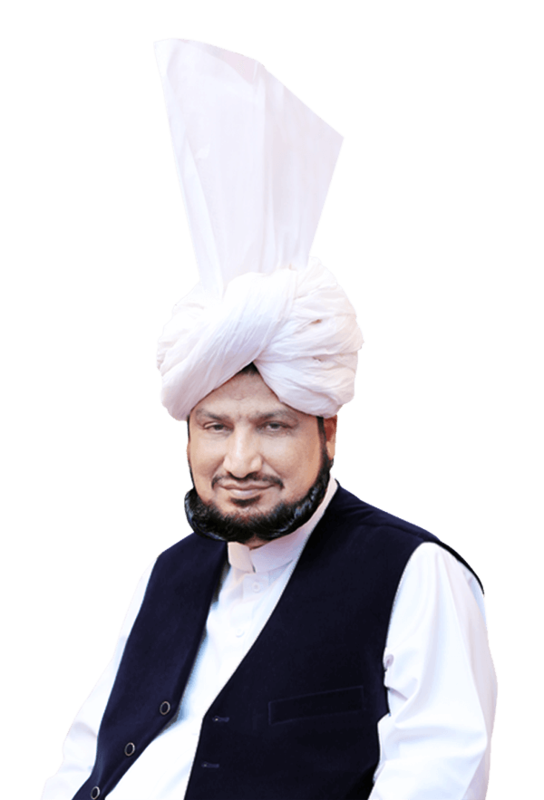 On the Friday of 23rd October 2009, Sultan-ul-Ashiqeen Sultan Mohammad Najib-ur-Rehman established the khanqah of Sarwari Qadri Order. Islamic date was 3, Dhu al-Qidah, 1430 H. It established in 4/A Sultan-ul-Faqr House, Education Town, Wahdat Road, Lahore. This khanqah has its doors open for everyone regardless of his status, sect or school of thought. Sultan-ul-Ashiqeen Sultan Mohammad Najib-ur-Rehman meets the seekers of Allah in this khanqah on every Sunday. Sultan-ul-Ashiqeen announced on 12 Rabi al-awwal 1437 H the project of new khanqah and a mosque. He requested the disciples to take part in it with great zeal. The construction will start soon. In August 2006, he laid the foundation of Sultan ul Faqr Publications registered. So, the teachings of Faqr started to spread through books and magazines. This institution has published many books and its detail is present in the book’s section. Anyone can read these books online. Furthermore, anyone can download these books free. Sultan ul Faqr Publications office is present within Sultan ul Faqr House 4-5/A, Education Town, Wahdat Road, Lahore. By reading the teachings of Faqr online, the seekers of Allah are able to reach out to Sultan-ul-Ashiqeen. Moreover, they are able to take online oath of allegiance. Above-mentioned websites are based upon Sultan-ul-Ashiqeen Sultan Mohammad Najib-ur-Rehman ‘s Life History and his books. Therefore, this website is informative for his disciples and devotees who want know about him. Tehreek Dawat-e-Faqr celebrates a grand Mawlid ( Milad e Mustafa ) each year on 21st March. As Sultan Mohammad Najib-ur-Rehman got Divine Trust on this very day. Allah gives them special titles according to their distinguishing attributes and levels. So that the world gets to know their grandeur and the level of belovedness. In the Holy Quran, Allah addresses His beloved Prophet Mohammad sall’Allahu alayhi wa’alihi wasallam with beautiful titles. For example, Yaseen, Taha, Al-Muzzammil (Thou enwrapped), Al-Muddathir (thou who art covered) etc. Similarly, Allah titled Shaikh Abdul Qadir Jilani as al-Ghawth al-Azam, Mohiyuddin etc. The sacred name of Sultan-ul-Ashiqeen is “Najib-ur-Rehman”. His spiritual guide Sultan Mohammad Asghar Ali gave him the patronymic of ‘Abu Al-Murtaza’ due to his beloved son Sahibzada Murtaza Najib. Since, the Sarwari Qadri order exalted to ultimate heights due to the efforts of Sultan Bahoo. So, all the spiritual guides who came after Sultan Bahoo have the title of ‘Sultan Mohammad’. In short, Shaikh Abdul Qadir Jilani, Sultan Bahoo and Pir Bahadur Ali Shah blessed Sultan Mohammad Najib-ur-Rehman with title of ‘Sultan Mohammad’. The title ‘Sultan-ul-Ashiqeen’ (the sultan of Divine lovers) conferred upon Sultan Mohammad Najib-ur-Rehman from the Mohammadan Assembly. It is due to his marvellous attribute of Divine love, which has dominated all his other attributes. For the revival of true Islam and spread, its soul Faqr, he got the title of ‘Shabeeh-e-Ghaus-ul-Azam’. It means ‘the reflection of al-Ghawth al-Azam’. Sultan Mohammad Asghar Ali conferred the title of ‘Aftab-e-Faqr’ upon his beloved spiritual heir Sultan Mohammad Najib-ur-Rehman. Its meaning is meaning ‘the sun of Faqr’. No doubt, he is the sun of Faqr, which is spreading its light in the whole world. Moreover, Faqr is not hidden now only due to his struggles. He got title of ‘Shan-e-Faqr’, which means, ‘the glory of Faqr’. Moreover, the reason of this title is that Sultan Mohammad Najib-ur-Rehman has manifested the glory of Sarwari Qadri Order. In addition, he has disclosed grandeur of all its spiritual leaders. Sultan-ul-Zakireen is the attributive title of Sultan Mohammad Najib-ur-Rehman. In fact, it is associated to his marvel that he grants all his disciples the sultan of invocations Hoo. Moreover, he blesses his seeker with it on very first day of oath of allegiance. To describe the beauty of Sultan-ul-Ashiqeen Sultan Mohammad Najib-ur-Rehman with humanly limitations would be injustice to his grandeur. In fact, words are inadequate to explain how impeccable and stunning he is. Since he possesses the light of Allah, his beauty is unexplainable. That is why only the true lovers of Allah can observe his real mesmerizing beauty. While seeing him, lovers wish for time to pause so they can absorb manifestation of Allah. Precisely speaking, every beautiful thing of the universe owes its beauty to the Divine beauty of Sultan-ul-Ashiqeen. His eyes are a Divinity filled fathomless ocean. It seems so immense that it contains the answers to all questions, which exist in the entire universe. Undoubtedly, his eyes are the doors to the Mohammadan Assembly. Moreover, spiritual power of his gaze cleanses the inward of the seekers. He usually keeps his eyes down out of modesty. However, it takes only his one glance to change the inward of the seeker and bless him gnosis. When he is silent, dignity covers him and no one dares to speak before him. Whenever, he speaks, his words are clearly audible and pleasant to hear. It is important to mention that his words have different meanings for different seekers according to their spiritual states. His words contain an ocean of meanings and are diverse. One phrase or sentence holds several meanings for a seeker, which he understands according to his inner state. He is always very logical and to the point. He speak in soft tones; no one has ever heard him shouting. His face is a prodigy of light of Ism-e-Allah Zaat. The lovers keep their eyes fixed upon his sacred face that exudes the light of Ism-e-Allah Zaat. Sometimes the light glows so much that it becomes difficult to look at him. Each seeker reads it according to his spiritual status. Yet there is surely something for everyone to read. Certainly, these words are not enough to describe the unmatched beauty of Sultan-ul-Ashiqeen Sultan Mohammad Najib-ur-Rehman. Sultan-ul-Ashiqeen Sultan Mohammad Najib-ur-Rehman is at the highest pedestal of best morals. Indeed all his attributes are the model and reflection of the beautiful attributes of the Holy Prophet. Therefore, it depicts that he is certainly on his footsteps. In short, patience, humility, perseverance, respecting others, modesty, magnanimity, dignity and courageousness are some of his attributes. Moreover, his glance is synonymous with benevolence, the word ‘compassion’ does not fully describe his kind behaviour. Thus, his sacred entity is perfect embodiment of beauty, excellence and kindness. Sultan-ul-Ashiqeen Sultan Mohammad Najib-ur-Rehman have a very kind and soft heart. Therefore, he cannot see anyone in pain and shares the sorrows of his disciples. However, he never tells his problems to anyone. He usually remains too busy in his work and activities of his organization Tehreek Dawat-e-Faqr. Even then, he spares time for his disciples to hear their issues and sacrifices his rest for this purpose. Moreover, his help and guidance reach the disciple in need, physically as well as spiritually. That is to say, he is aware of every esoteric and exoteric condition of all his disciples. Although, not every disciple is sincere towards him, even then he helps him. In addition, he does not keep even his insincere disciples deprived of his kind attention. Furthermore, he forgives the mistakes of his disciples no matter how big they are. Rather, he makes them learn from the mistakes. Moreover, hiding others faults is also one of his special attributes. But, he sagaciously makes the disciples aware of their shortcomings to improve themselves inwardly as well as outwardly. Sultan-ul-Ashiqeen is unprecedented in intelligence and wisdom. He is conversant not only with religious and inward knowledge but also with worldly and outward knowledge. Whether it is the knowledge of history, geography or science, law or politics, he has perfect command over them. It is a fact that the Fakirs have the inspirational knowledge. So, they become aware of knowledge of entire universe. However, Sultan-ul-Ashiqeen not only has the inspirational knowledge but also the exoteric knowledge. Additionally, his literary work is the proof of his command over every kind of knowledge. In addition to intelligence, hard work and dedication are his greatest attributes. In fact, his entire life is a struggle. Though Allah’s favours always remained with him, yet he left no stone unturned in his struggles. He makes his efforts to the fullest that is why Allah blesses him to the fullest. He not only works hard himself but also inculcates this attribute in his disciples. In this way, he persuades them to work with dedication and perseverance. His hard work becomes a source of inspiration for his disciples and keeps their spirits high. Humility and simplicity are his marvels. Although, he is s at ultimate levels yet he lives like common people out of his humility. He is simple in his ways of living yet very graceful and elegant. Sultan-ul-Ashiqeen Sultan Mohammad Najib-ur-Rehman strictly follows sharia. He neither likes nor allows interaction of male and female disciples. Therefore, the male disciples cannot visit his house while the female disciples cannot enter khanqah. In this way, he has maintained the rules of shariah strictly. Moreover, he respects the women extremely and talks to them keeping his eyes lowered. Furthermore, he loves all children. He is the best administrator and the patron. The way he supervises and organizes every department of Tehreek Dawat-e-Faqr, is unparalleled. Being on the footsteps of Prophet Mohammad, he is the ideal in any relationship or role.